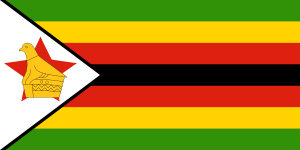 Zimbabwe is a landlocked country in southeastern Africa that is slightly larger than the state of Montana. The United Nations estimates 12.5 million as the population ofZimbabwe. These figures fail to account for the massive emigration that followed the economic/social meltdown of the country or the extensive scourge of disease. Estimates suggest 25-50% of the population fled the country, mostly to neighboring African states. Mismanagement, corruption, disease, and the land re-distribution program that seized white-owned farms prompted hyperinflation and mass unemployment (over 90%). The Zimbabwean dollar was also abandoned for the US dollar and the South African rand. Education and health systems were paralyzed by the economic free fall. In 1965 the white minority declared Rhodesian independent from Great Britain, leading to guerrilla warfare and eventual independence as Zimbabwe in 1980. Zimbabwe was a one-party state and dictatorship led by Robert Mugabe until Morgan Tsvangirai effectively won the 2008 election and a power sharing agreement was formed. Mugabe retained the Presidency and Tsvangirai became the Prime Minister. This agreement has brought some progress to the country since 2008. The official language of the country is English with Shona widely spoken, and Ndebele in the West. Forty per cent of the population is under 15 years; life expectancy is 43.3 years. One fourth of Zimbabwean children are orphaned due to disease and malnutrition. Approximately 80% of the population is Christian, and churches work hard to meet the many desperate needs of the people.